Your planner is a great tool for organizing your time, but you can make it even better. When people take the time to personalize their possessions, they tend to use them more. If you can make your planner represent the important aspects of your life and personality, you’ll find that they not only work to organize your time, but also your life. With a few well-designed forms, your planner can serve as a personal motivator for your health goals, or it can encourage you to stick to your financial budget. With customized tabs, you can create a place to track your medical expenses, make it easier to find important lists, and help you manage your personal endeavors. Plastic inserts make it easy to carry the things that can’t easily be hole-punched, but are helpful to have such as pencils and erasers, business and credit cards, and family photos. Something as simple as a page finder can make scheduling and tracking your daily events thoughtlessly simple. You can have your planner open to the right day in less time that it would take to find your calendar app on your smartphone. 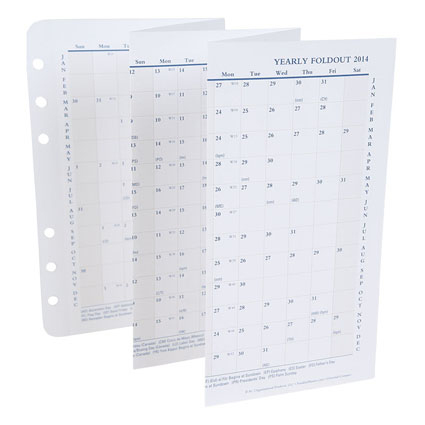 Yearly foldout calendars let you track the big events of each year with ease. Simply open the calendar and you can see in advance when your niece is getting married, what day your vacation will begin, or find a quick reminder to send your parents their anniversary card. And this is only the beginning. Your planner can become your office manager, your wallet, and even your little black book. Why try to keep all that information in more than one place when your planner is such a convenient and effective tool? Now that you have your planner and the year is underway, take a look at how you can accessorize it so you can use it to it’s fullest potential. I love the flexibility of my planner! By adding a zip pocket, I can be purse-free. I\’ve created form bundles for each client that contain meeting agendas, to-do lists and checklists, planning pages, ledger pages, and 3-month calenders. I can meet a client and have all the information in one handy place. The beauty is not having to carry everything all the time; like swapping purses, you just take what you need for the day and staying on track becomes an simple process. Previous PostPrevious Why Keep Your Old Planner?